Andy Liu and Wu Hao undefeated in Masters: And then there were two. After four rounds of spirited play in the 2017 US Open Masters Division, just two players remain undefeated: Andy Liu 1p and Wu Hao 2p. Wu Hao began the day by defeating 2016 Masters champion Bao Yun in a game that looked good for the defending champion until the late endgame, when the margin had narrowed so much that Bao was forced to launch a last ditch — and as it turns out, unwinnable — ko that cost him a large group and the game. 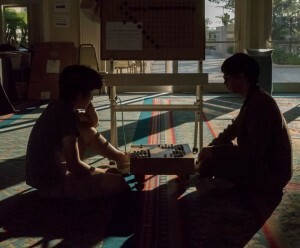 In the evening round, Wu Hao forced Ryan Li to resign after just 150 moves. Andy Liu beat Eric Lui 1p in Round 3 and then bested Tim Song 1p in a dramatic game that included a late-game swap of groups. Check the Masters crosstab for latest results and top-board game records. Tuesday’s Congress coverage: The E-Journal’s live coverage on Tuesday, August 8 begins with a preview of the day on the AGA’s YouTube and Twitch channels at 8:30a PDT, and broadcast of Round 5 of the U.S. Masters top boards starts at 9a on YouTube/Twitch and KGS, with pro commentary starting around 10a. 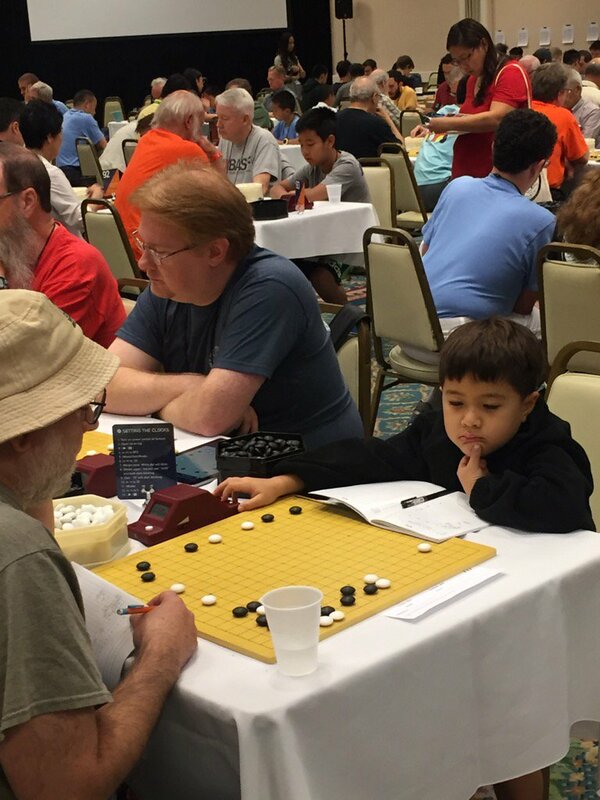 At 2p we’ll broadcast Bao Yun’s “Blindfold Go” game against Ryan Li on all three platforms. Congress tournament recap coming: Watch the website Tuesday morning for our updates on the Lightning, Youth Lightning, 13×13 and 9×9 tournaments. Meanwhile, check the US Open crosstab for latest results. Jennie Shen 2p on the Round 1, Board 2 game between Bao Yun and AaronYe. Yilun Yang 7p on the Round 2, Board 4 game between Andy Liu and Albert Yen. Shirley Lin 1p on the Round 3, Board 2 game between Bao Yun and Wu Hao.